This iExpression links a 1D property to the average of two other properties. Average means that the property is always in the middle of the two linked properties. 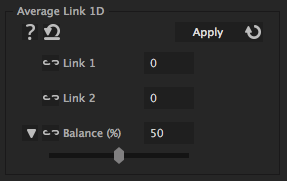 You can also compute weighted averages where one of the two values has a stronger influence than the other by using the 'balance' parameter. is the first of the two properties whose average should be computed. Don't put a number here. Use the link button to link this to some other property. is the second of the two properties whose average should be computed. Don't put a number here. Use the link button to link this to some other property. denotes how much weight each of the two properties has for the average. A value of 50% means that each of the two has the same weight such that the result is exactly in the middle. For smaller values it gets closer to the first property and for larger values it gets closer to the second one.